As discussed in the Section "Clan Diaspora" and the accompanying paper "The Gin Clan in the Pacific Rim", the support of the Clan to "new chums" arriving in a new country or about to commence a new venture, cannot be underestimated. Clan members share the surname and are all related to a common ancestor. By way of example and further elaboration on Clan Heritage matters, in this page we explore in greater depth the Chin/Gin Clan (甄). The author of this page is the 27th Generation of the Gin Clan Ancestor, Gin Sun Hall. Most of the material contained in here comes from the Gin Clan, which is flourishing in places as diverse as the USA, South East Asia, Australia, New Zealand, the Americas. Specifically the information is extracted from the research of Albert Gene, Harry Gin, James Gin, Wing Kuon Gin, Yun Hoi Yan, Wing Wei Yan, Robert Chin and other researches of the Gin Sun Hall Associations around the world. Extracted from a 1997 publication produced by the "Gin Sun Hall Benevolent Association" of San Francisco, California, USA, in celebration of its 60 Anniversary. "The Gin Surname is believed to have derived from an ancient Chinese governmental designation, which was used to designate the occupation of a "potter", one who crafts earthenware." The transliteration of the Chinese Surname (甄) includes: Gin, Ginn, Gean, Gen, Gene, Jen, Jin, Ying, Yan, Zhen, and Chin. As with any transliteration, variations can be quite many. The "Sun Hall News", a Clan Magazine published by the Gin Sun Hall Association, Kaiping, People's Republic of China identified the ancestor of all Gins as Gin Shen, whose ancestral home was in the Hebei province. "Gin Sun Hall is the name of our common ancestor who lived in the 13th century A.D. Gin Sun Hall's grandfather, Gin Shing Hing came to Nam Hong county in northern Guangdong Province from Northern China, as he was appointed the government official for the area." "Later for various reasons which remain unclear, but believed to be the result of dissent of the locals to imperial decrees and it was also rumoured that one of the emperor's concubine disappeared near Nam Hong. The Sze Yap (SiYi) people living in the area of Nam Hong County, including the Gin clan, had to flee to avoid being persecuted by the Emperor. Many Gins as well as other surnames changed their names to avoid Imperia detection. This may account for the reason why today the Gin surname is small in numbers compared to other surnames." At the Inaugural Gin Clan World Conference held in November 2005, at Kaiping, PRC, some 700 Gins and their friends and relatives attended the meeting. From the attendance list, it was clear that Gins can virtually be found in all continents of the world. The most populous concentration appears to be California. There was a proud contingent of Gins from the original Gin Homeland of Wuji, Hebei (河北). It is interesting to note that according to wikipedia, "Plains in Hebei were the home of Peking man". Thus, the Gins have a proud history with links to the Great Plains of China. At a later date, it is our intention to further add to this section, so that interested scholars can see how one can trace one lineage. But meanwhile, we share with readers the Generation Number, Generation Name and names of a particular line associated with the Shek Hoi ( 石海) village. Gin Clan Generation Names for other branches of the Gin is shown in the photograph below. 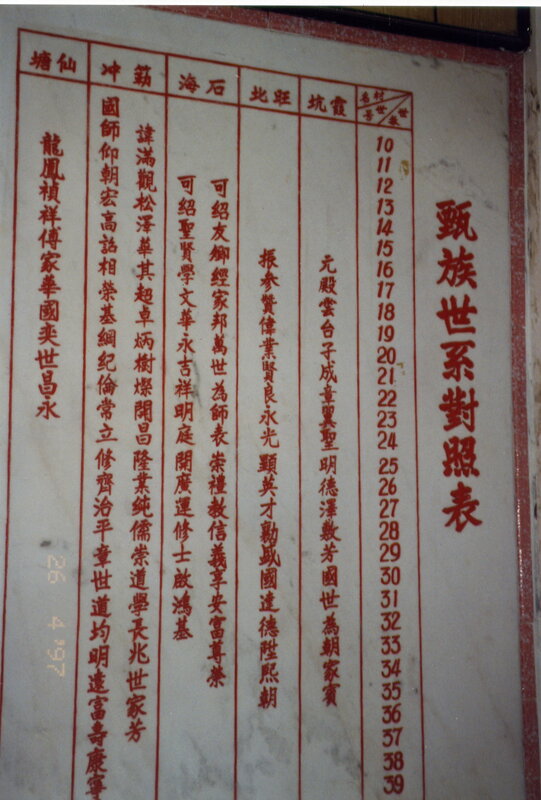 Each "Sub Heung" has its own Generation Name list, as displayed in the photo below. More on the topic of Gin Generation Names will be discussed at a later date.